Consult Civil Actions Against the United States, Its Agencies, Officers and Employees if you are involved in litigation with the U.S. government or its officers, employees, or agencies. 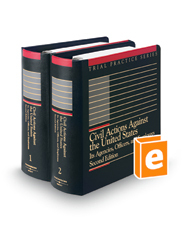 It discusses the specific types of actions that can be brought against the government or its employees, and it explains common substantive and procedural issues. A table of relevant statutes and cases and an index are included.